AUDIO MP3 – Hornbills in the rain – Jalan Jelutong – Pulau Ubin. 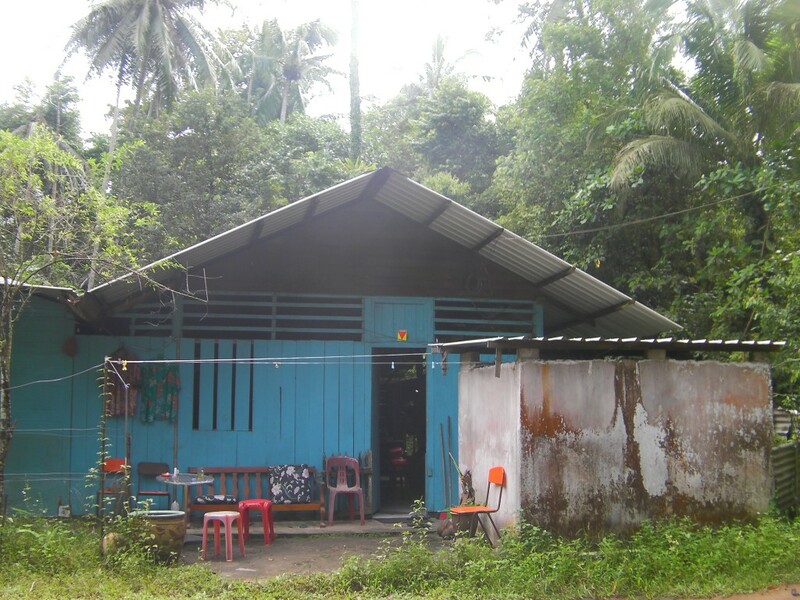 In 2012 I was invited to live for a month, from May 6th until June 6th, as an ‘artists in residence’ on Pulau Ubin by The Artists Village (TAV) group based in Singapore. An exciting prospect for me not least for the fact that I am attracted and obsessed by islands and island cultures and it turned into a major experience and project in my life. My initial ‘project’ idea was to make a ‘sound map’ of the island. Places which I had visited and made field recordings where others could visit and have a similar listening experience. It turned into much more than that for me and not just as a listening experience and I ended up making three short video films as well as an hour long audio soundscape. It was impressive from a point of view that I had not experienced before anywhere else. Probably partly because I have never spent a month (almost) alone in a house in a tropical jungle. I say almost alone because I shared the residency with Japanese artist Yuzuru Maeda. During my many visits to many islands around the Pacific Ocean and South East Asia (Tahiti, Fiji, Hawaii, East Timor, Bali, Penang, Langkawi, Perhentian Islands and Sarawak amongst them) I have made many hours of ‘field recordings’ of the local acoustic ambience or soundscape. On my initial visit to Ubin I was impressed by the number and the volume of the different sounds of birds, insects, electrical generators, boats and aircraft taking of from nearby Chiangi airport and, mostly at night, the thunder storms. I decided I would spend my month walking and making sound recordings from which I would produce a c.d. and my sound map of the various “listening sites’ where I made the recordings. I decided to walk partly because I noticed most visitors to the island hired bicycles to get around. Understandable if you have limited time and the heat and humidity isn’t conducive to walking for most people. However I do feel people miss a lot of the acoustic environment by not walking. It is also planned that an App for mobile phones will be developed enabling the public to download all the information and samples of the sounds collected. The recordings will also be downloadable free from The Artist Village website and from the Internet Archives. The videos and audio recordings are part of a three screen audio visual installation. Yuzuru Maeda and I gave a live performances of our ’24 Gestures For Guitar and Sardod’ improvisation played across 12 minutes of one of my field recordings. I also gave a solo performance in complete darkness and Yuzuru performed her own solo Ubin ‘Zentai’ video project, at the Goodman Arts Centre in Singapore. Pulau Ubin is the second largest off shore island located off the North Eastern end of Singapore, between Singapore and Malaysia. It is a granite island with an area of 1020 hecters with low lying mangroves and tidal rivers. Originally it was five small islands which were bound together for prawn farming forming a single island known as Pulau Ubin, meaning ‘Tile Island’ in Malay and Indonesian. It was also known as Pulau Batu Ubin ( Granite Tile Island ) to the local Malays and “Chieo Suar” ( Stone Hill ) to the older Chinese generation in Fukien dialect. In the early colonial 20th Century days of Singapore, granite was quarried in the form of blocks , slabs and tiles for floors and walls. The original causeway linking Singapore to Malaysia was built in 1923, using granite from Pulau Ubin. Granite mining stopped in the 1960s and the quarries became lakes and the surrounding areas re-colonised by vegetation and jungle. There were also plantations of rubber, cocoa, coffee and pineapple in the past. The island had been a forgotten backwater for many years but due to the limited land mass on the Singapore Island it came onto the radar for redevelopment by the government in the 1980s and a process of resettling the villagers to Singapore main island began. However some preferred to remain as long as they could on Pulau Ubin until the redevelopment commenced, particularly the older generation. At the beginning of 2000 there was public protest, particularly from groups of ‘nature deprived’ Singaporeans,as well as from the remaining inhabitants. Toward the final stages of resettlement the biodiversity of the Chek Jawa wetlands and the rich marine life of the coastal areas became apparent and the government took an interest in improving the amenities on the island; paved roads, built shelters, information kiosks and a visitor centre at Chek Jawa . The once inaccessible south eastern coastal strip of the island was opened up to tourist with an observation tower, boardwalks, viewing jetty, and a visitor centre set up. This however is discreetly changing the face and nature of Pulau Ubin from untouched to planned, and maybe paving the way for further developments. By 2009 there were less than 45 families still living in Ubin and, for the moment, Pulau Ubin is a living example of a former rural way of life which will most likely disappear with the last of its “kampong” generation passing. It has also become a haven for birds (there are around 400 different species) and other wild life, such as monkeys, wild boar, snakes, lizards and insects. My artistic ‘work’ and interests are many and diverse and among them is an interest in acoustic ecology sometimes called ‘ecoacoustics’ or ‘soundscape studies’; described (by Murray Shafer author of The Tuning Of The World -1997) as ” the relationship, mediated through sound, between living beings and their environment.” It is a discipline that analyzes how we interpret and are affected by natural and artificial sounds around us. Shafer also suggests that people ‘echo the soundscape in language and music’. With this latter statement in mind I have for many years been incorporating my field recordings into my live improvised music concerts. Anthropologist/Musicologist Steve Feld coined the name ‘Echo-Muse-Ecologist’ which I quite like and feel an affinity with. Ubin is exceptional, in my experience, as a soundscape. Apart from its variety I found day time insects communicating at a volume equal to heavy daytime traffic on Singapore – an equivalent of 80 decibels sometimes with an equally impressive frequency range – almost unbearably high (to humans) when listened to for a lengthy period of time. Apart from long hours walking I spent many hours sitting outside the house alone especially at night. At night the soundscape and the visual aspect changes dramatically from that of the daytime. Humans have limited night vision and the forest takes on an ominous and perhaps, to some, threatening aspect with unexpected and unknown sounds issuing at unknown distance. The daytime birds are replaced by less frequent sounds of nightbirds and a whole different acoustic world of insect sounds. I experienced something which I compared to swimming underwater in the Ocean. Of being inside an organic alien medium. I began to perceived the forest and its sounds as one complete, unified, thing – similar as I said to the underwater Ocean world, which is a complete and separate world from our normal daytime on-land experience. I was experiencing an ‘Oceanic Feeling-Like’ (*) maybe? When I returned home to Rome I found two articles on line which seemed relevant to my experience and confirm some of the more subtle intuitive feelings that I had. In the first video link below Researchers at the University of British Columbia are conclude that trees are interacting with one another in a symbiotic relationship that helps the trees to survive. Connected by fungi, the underground root systems of plants and trees are transferring carbon and nitrogen back and forth between each other in a network of subtle communication. Similar to the network of neurons and axons in the human brain, the network of fungi, roots, soil and micro-organisms beneath the larger ‘mother trees’ gives the forest its own consciousness. In the second link a new radical theory of how the brain evolved via a symbiotic relationship with plants, and our current state of species wide neural retardation is discussed. The first deals with the idea of trees and plants ‘communicating’ (although obviously not in a conscious way) with one another through root systems, soil and fungi. It is one of several articles I found on line that deal with plant and tree ‘communication’. The second video concerns and discusses a book titled ‘ An Alternative Evolution Of The Brain’ and is compatible with the first piece. It talks about amino acids and where they come from (plants) and their effect on our brain and consciousness when they are depleted. I feel both ideas have some bearing on my ‘Oceanic Feeling-Like’ on Ubin. Are the insects trying to tell us something? A non-academic book on the subject that I can recommend reading is Bird Song by Don Stap – published by Scribner 2005. Our relationship with birds at the house was good. When I arrived there was a nest, only one meter from the ground, in a small bush close to a set of double doors, which we refrained from using. Both eggs hatched out while I was there but unfortunately a Green Whip Snake appeared one day and although we didn’t actually see it we suspect it took one of the baby birds. The other grew and surprised us one day by suddenly standing on the edge of the nest and flying to a nearby tree where its parents were calling it. The latter part of its development seemed very fast from scrawny bird-like thing to feathers and flight. Just before it left a pair of Sunbirds (small hovering birds) appeared and began to make a nest over the front door. A remarkable thing to witness the work, seemingly done by one of the birds only, of weaving small pieces of moss and tiny leaves together with spiders web. I was able to video this and take photos. i was also impressed with the speed at which it was accomplished. When they started I thought that it would take maybe a month but within a week the single bird had built a hanging nest several times its own size. I left before she laid eggs but I hear that they hatched and that another pair (maybe the same pair?) of birds had built another nest in the spot where the Whip Snake had been seen outside the double doors of the house. One morning a big brown and black Coucal, which I had never seen before, came to visit and I managed to video it briefly from inside the house. On my soundscape recordings you will hear many more birds than I actually saw, Woodpeckers for instance. It is estimated that Pulau Ubin is home to between 150 and 300 different species,depending on the time of year – some resident and some passing immigrants. The soundscape is meant to be listened to as a complete and continuous work, however I have put track markers for convenience. The recordings were made over a period of a month and not in the order they appear here. These ‘Listening Sites’ were chosen at random and at different times of day and night as I walked and are not meant as a definitive guide to anything and I cannot guarantee you will hear what I heard if you visit the same spot. This work is simply an invitation to walk and listen and enjoy sound. Insects birds and animals all use sound as a means of communication so don’t let them waste their time, become a part of it. Eight of my favourite ‘Small Island Cultures’ books. Many thanx to The Artists Village – Jeremy Hiah, Reef, Jason Lee, Lee Wen, Kai Lam and all friends in Singapore and special thanx to Yuzuru Maeda for inspiring company and for the short clip from her video seen in mine.